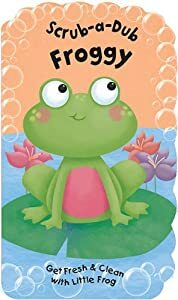 Scrub-A-Dub Froggy: Bath Mitt and Book Set makes getting clean so much fun. The vinyl bath book can go right into the tub with children during bath time. They'll love hearing how little frog gets cleaned up by showering under a waterfall, brushing his teeth, washing his hands, or taking a bath in a warm jungle pool. The plush bath mitt doubles as a froggy hand puppet for even more tub time fun! For anyone that has given a bath to a little child it is truly an adventure much of the time, and the child usually wants to have more water out of the tub than in. This is especially the case when you do not have things for the child to do or focus on. This book is a great book for any parent. The book is colorful and fun to read with the young child. The pictures are large and with the bath mitt you can make some of the book come alive for the child too. This was a great interactive book that will help you not only engage your child, but get him/her clean in a fun and educational way!